Overview - Hollywood, 1927: As silent movie star George Valentin wonders if the arrival of talking pictures will cause him to fade into oblivion, he sparks with Peppy Miller, a young dancer set for a big break. Progress is an innate and necessary function of society. All things grow and evolve -- even art forms. Simplicity gives way to complexity, and bricks build upon bricks, but any towering masterpiece still needs a solid foundation. The core, the very heart of any medium lies in its humble beginnings, and we must never forget where they come from, lest we lose sight of where they may one day go. For cinema as we know it, that steady groundwork is shaped by the silent era; the works of Melies, Porter, Griffith, Chaplin, Eisenstein, Murnau and countless others. Works fueled by sweat and blood, by shadow and light. Works hushed in infinite silence… but with images that sing. They sing a song of simplicity and soul, of early innovation and pioneering spirit. They sing an old, jaunty tune, joyful but with bits of melancholy -- a song all but forgotten to most, a half remembered melody that comes to us in our dreams. Michel Hazanavicius' 'The Artist' attempts to remind us of that song, to replay it in our hearts, to make us wonder why we ever stopped listening to it at all. Gorgeous and stirring, the film does indeed do justice to that fading tune, but a mere recital of the past is not a complete work unto itself. You see, the song has indeed remained the same, and as glorious a song as it is, that may no longer be enough. Georges Valentin (Jean Dujardin) is a popular silent film star. Charismatic and handsome, he lights up the screen and brings an earnest passion to his work. When he meets a bright-eyed film extra, Peppy Miller (Bérénice Bejo), sparks fly, but the actor chooses to remain loyal to his wife (Penelope Ann Miller). As sound films become the latest fad, Georges refuses to jump onboard. His career quickly hits a downward spiral and it seems like he may not be able to recover. Meanwhile, Peppy's career in "talkies" quickly takes off, and she blossoms into a rising star. As the old is pushed out to make way for the new, these two love-struck artists find their fates intertwined. Shot in the style of an old silent film, the movie hits all the right narrative and visual beats. Hazanavicius presents a loving homage to the old-fashioned craft of cinema's early days while managing to tell a simple but very moving story without any spoken dialogue. The images themselves are rightly brought to the forefront with memorable compositions that are filled with loving nods to classic silent films. Facial expressions, visual gags, and little bits of physical business take on great importance, propelling plot and character. Music also becomes a major factor, acting as a guiding hand that enhances moments, performances, and dramatic turns without overpowering them. Free of the many imposing cinematic techniques that riddle contemporary motion pictures, a greater level of active participation is called upon from the audience, allowing viewers to create meaning for themselves. All of the elements of filmmaking end up wonderfully balanced on screen, effectively communicating the touching story in a straightforward, but emotionally powerful manner. Jean Dujardin is masterful as Georges Valentin, earning every ounce of his well deserved Oscar. A charming movie star who evokes the likes of Douglas Fairbanks, Errol Flynn, and Gene Kelly, he crafts an absolutely timeless and utterly likeable persona. As his character finds himself in a downward spiral, the actor reveals limitless range, hitting all the tragic lows with heartbreaking ease. As Peppy, Bérénice Bejo becomes a cinematic pixie full of life and spirit. She shines and sparkles in every scene, and much like Dujardin, displays an endless range of emotion through nothing more than facial expression, body language, and demeanor. The remainder of the cast are all fantastic as well, with nice turns from John Goodman, Missi Pyle, Penelope Ann Miller, and especially James Cromwell. One scene, where Cromwell's character quietly looks on at Georges in distress, is especially impressive, and the amount of subtle but devastating emotion that the actor is able to imbue in his eyes alone is truly affecting. The whole ensemble really rises to the challenge, seamlessly bringing their silent characters to life so naturally, that most audiences will soon forget that they're "supposed" to be talking. While Hazanavicius mostly sticks to a very traditional silent film structure and style, there are a few bursts of ingenuity and creativity peppered throughout. A certain playful, slightly self-referential sense of humor sneaks in every now and then through a few clever gags. An early dream sequence reveals a faintly meta undercurrent as well. While I don't want to spoil the sequence here (even though the Academy Awards already did), the scene plays out like a nightmare for silent cinema itself, and is among the movie's most interesting set pieces. The story is quite old-fashioned in many respects, but there are hints of modern narrative sensibilities throughout, leading to a few dramatic moments that would most likely be too intense for an actual 1920s silent film. Unfortunately, these splashes of true originality prove to be few and far between, leading to my only real criticism. In the included special features, film critic Wade Major praises the director for the manner in which he revives the old cinematic grammar of silent films. While that is certainly a commendable feat, it actually exemplifies my main issue with the movie. As wonderful as the film is, there is a lack of true imagination here. The movie has been praised over and over for the method in which Hazanavicius recreates the style of silent cinema, and though that is impressive in its own right, I fail to see what's so special or even interesting about such an accomplishment. All the director is really doing, is the exact same thing silent filmmakers did eighty five years ago -- and quite honestly, they did it better. To this point, the film's frequent reliance on intertitles with written dialogue can be troubling. Some of the back and forth gets so verbose that I started to question why the characters just didn't talk. Intertitles are of course a feature of many classic silent films, but the directors of the time understood that dialogue was not an option for them, and they geared their stories toward specific narratives with that in mind. Here, it seems like Hazanavicius occasionally forgets to do this, and there are moments that seem to betray his chosen style. While the film does occasionally hint at more beyond mere homage and reproduction (the aforementioned dream sequence, for instance), Hazanavicius doesn't expand upon these potentially fascinating bits, and instead chooses to play it safe with a mostly by-the-books, traditional approach that offers nothing new. In many ways, the movie is just as guilty of being formulaic and unoriginal as the mediocre dreck that mainstream Hollywood spits out every week. In fact, large portions of the film's climax are bolstered not by Ludovic Bource's Academy Award winning score, but by excerpts from composer Bernard Hermann's famous theme from Alfred Hitchcock's 'Vertigo.' Ultimately, the movie has trouble finding a true, unique voice, and while it pains me to say this considering how much I like the film, at its worse, it just feels like an imitation rather than an original piece of art. There is perhaps no better way to enumerate the film's flaws than to place it against my personal top two choices for 2011's Best Picture -- 'Hugo' and 'The Tree of Life.' With 'Hugo,' Martin Scorsese also examines the world of silent cinema and touches upon similar themes of progress. The difference is Scorsese doesn't rely on the methods of the past to do so. Instead, he looks at history through the prism of the future, telling a tale that both laments change and celebrates growth while quite literally doing the exact same thing through the very form of his filmmaking and experimentation with modern 3D technology. In contrast to 'The Artist,' 'Hugo' doesn't sing an old song from the past -- it sings a new song about the past. On a similar note, Terrence Malick's poetic masterpiece, 'The Tree of Life,' essentially presents the exact opposite experience of 'The Artist.' While Michel Hazanavicius goes out of his way to adhere to an out of vogue but still tried-and-true cinematic grammar, Malick attempts to reshape the very syntax of traditional film structure. Conventional narrative is dissected and reformed, breaking away from customary techniques to present a new, wholly unique experience. Sure, 'The Tree of Life' owes quite a lot to classic experimental cinema and contemporary video artists, but Malick manages to take his influences and synthesize them into a truly singular piece. Unfortunately, I'm not so sure the same can be said about Hazanavicius' film. In order to understand our future we must always look to the past, and 'The Artist' presents a glorious window into cinema's silent era. Unfortunately, while the view can indeed be breathtaking, the window offers very little we haven't already seen, providing ghost images that hit all the right notes but lack that extra spark of innovation and inspiration. For a film that is in part about progress, director Michel Hazanavicius disappointingly brings little new to the cinematic conversation. Despite these criticisms, I do want to stress that 'The Artist' is still a very good film -- I just don't think that it ever finds a true identity of its own. As an attempt at celebrating and recreating the beauty of the silent film art form, it's a triumphant success, but as a true stand alone film, it's a little lacking. This is a movie that wrestles with greatness throughout its runtime, and while it has moments of brilliance and true magic, as whole it never quite follows through on its potential. Still, the end results are moving, enchanting, and utterly captivating regardless. In many ways, the movie serves as a perfect introduction to silent cinema, and those that enjoy the movie should not hesitate to check out the genre's many storied classics ('The Gold Rush,' 'Battleship Potemkin,' 'People on Sunday,' and 'Modern Times' are all great examples). Though imperfect, Michel Hazanavicius succeeds where it counts, and if nothing else, the film demonstrates that there's still plenty of life and noise left in the silent art form. 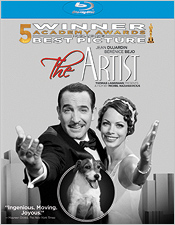 Sony brings 'The Artist' to Blu-ray on a BD-50 disc packaged in a keepcase with a cardboard slipcover. After some skippable trailers the disc transitions to a standard menu. A code for a redeemable UltraViolet digital copy is also included. The movie is provided with a black and white 1080p/AVC MPEG-4 transfer in the 1.33:1 aspect ratio. Faithful to the filmmakers' stylistic intentions of replicating the aesthetic of classic silent films, the movie looks great on Blu-ray. The print is in wonderful shape and outside of a fleeting hint of banding in a shot or two I detected no major technical issues or artifacts. The majority of the presentation has a very clean look with light grain but certain shots from several movies within the movie feature an intentionally grainier appearance. Detail is solid, showcasing all of the film's incredible period accurate production design, sets, locations, and costumes. With that said, the movie does adhere to an intentionally soft visual style with diffuse lighting and a frequently hazy quality that harks back to the films of the 1920s. Whites are bright and offer nice pop but black levels are a little elevated, causing a slight decrease in overall contrast. 'The Artist' succeeds in replicating the style of 1920s silent cinema, and while that aesthetic isn’t always impressive in a traditional sense, the picture is still quite pleasing and authentic. With no signs of unnecessary manipulation or compression, the images shine through exactly how the director intended. It might not be the sharpest or most eye catching video presentation, but it's still very nice. The audio is presented in a DTS-HD MA 5.1 track with optional English SDH and Spanish subtitles. Being a silent film, the mix is essentially made up of the movie's score alone, and while the sound design isn't as enveloping as I would have liked, the music comes through well. Ludovic Bource's Academy Award winning score is terrific and the mix offers solid range and fidelity throughout. The various melodies and themes complement the visuals perfectly, enhancing the story. While there is some separation across the front speakers, surround activity is pretty negligible with only some faint echoes of cues hitting the sides. This relatively small soundstage is understandable, however, given the subject matter and intentions of the filmmakers. They keep things very simple so as not to overpower the silent era visual style. With that said, the results can't help but sound a little too reserved and contained at times. Though a more expansive auditory field might have clashed with the content, a bit more separation could have made the experience more immersive. A few of the movie's dramatic and tense moments offer decent bass response, bolstering the action and conflict on screen through deep musical cues. Though a silent film (for the most part), music still plays a large role in the movie's storytelling. Thankfully, this mix is very solid and the score sounds quite good. Though the soundfield is a bit small, the lack of surround activity makes sense given the specific content and style. Sony has put together a nice selection of supplements, including a few featurettes and interviews. All of the extras are presented in 1080p with Dolby Digital 2.0 audio and optional English SDH subtitles. Blooper Reel (HD, 2 min) - A fun but brief reel of silent bloopers is included that shows a few blown takes and silly interactions between the actors. The Artist: The Making of an American Romance (HD, 22 min) - This is an interesting behind-the-scenes featurette that details the movie's themes, characters, locations and plot with lots of cast and crew interviews and on set footage. We get a look at some of the rehearsal process and also learn a bit about film history and silent era cinema. While some of the interviews can veer too much toward standard mutual complimenting, most of the material covered here is worthwhile. Q&A with the Filmmaker and Cast (HD, 45 min) - Here we are treated to an in-depth Q&A session with the director, producer, and the majority of the cast. Conducted after a screening of the film, the participants offer lots of information about the shoot, the script, and the overall experience of working on a contemporary silent film. Hollywood as a Character (HD, 5 min) - This is a quick featurette focused on the movie's numerous L.A. locations. The Artisans Behind The Artist Featurettes (HD, 12 min) - Four featurettes detailing the film's production design, cinematography, costumes, and composer are viewable separately or together. While there are some repeated bits of information from earlier supplements, each category offers a decent look at their respective topics. Sneak Peeks (HD) - Six trailers for other Sony releases are included. 'The Artist' is a truly moving and beautiful film that celebrates and recreates the magic of silent cinema. Unfortunately, the movie rarely rises above mere reconstruction, and while the performances, cinematography, and dramatic beats are all very enjoyable, they offer little we haven't already seen before. Still, though it may be familiar, like an old, favorite song it's well worth another listen. The video and audio are both good, presenting a respectful and authentic experience. Supplements offer an informative and entertaining peek into the film's production. Its Best Picture win might be a little undeserved, but there is no denying that 'The Artist' is a very good film, and thankfully this disc does it justice. Recommended.